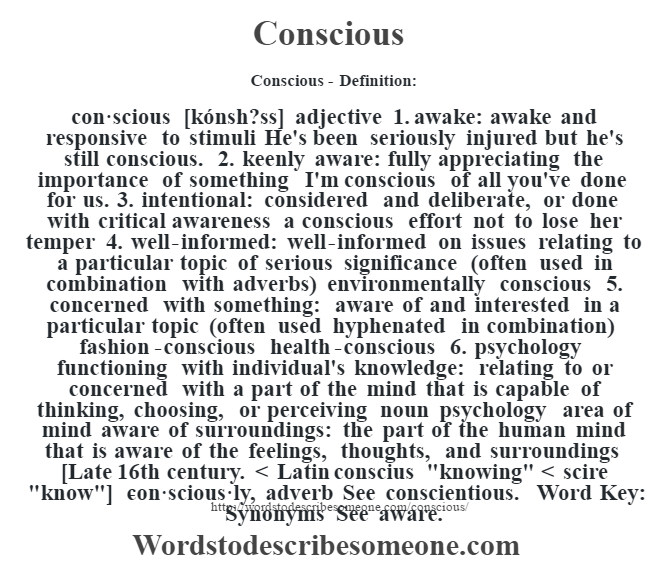 con·scious [kónsh?ss] adjective 1. awake: awake and responsive to stimuli He’s been seriously injured but he’s still conscious. 2. keenly aware: fully appreciating the importance of something I’m conscious of all you’ve done for us. 3. intentional: considered and deliberate, or done with critical awareness a conscious effort not to lose her temper 4. well-informed: well-informed on issues relating to a particular topic of serious significance (often used in combination with adverbs) environmentally conscious 5. concerned with something: aware of and interested in a particular topic (often used hyphenated in combination) fashion-conscious health-conscious 6. psychology functioning with individual’s knowledge: relating to or concerned with a part of the mind that is capable of thinking, choosing, or perceiving noun psychology area of mind aware of surroundings: the part of the human mind that is aware of the feelings, thoughts, and surroundings [Late 16th century. 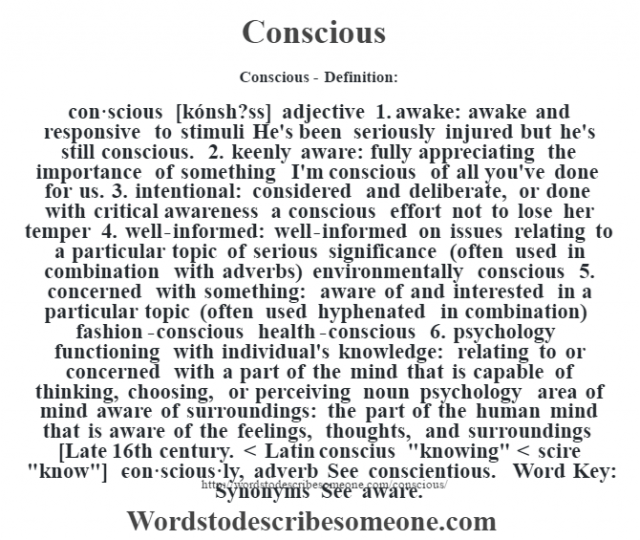 < Latin conscius "knowing" < scire "know"] -con·scious·ly, adverb See conscientious. Word Key: Synonyms See aware.